Are you looking for the best Gigabit Ethernet cables? Gigabit Ethernet is perhaps one of the modern trends in wired LAN networks. 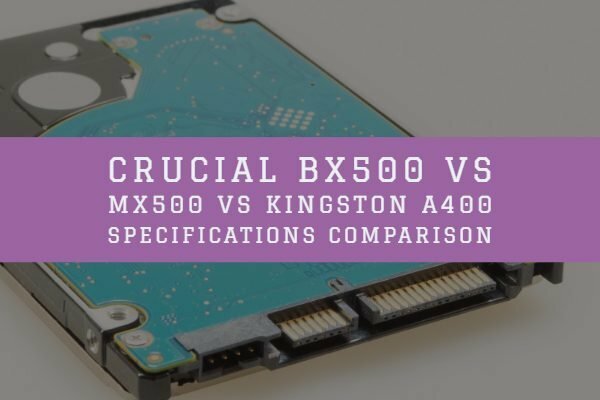 With newer specs and acronyms, it is quite easy for the layman to get confused about the new tech trends and terminologies. It is especially true for those who are looking to find clear information on LAN cables for home and business use. Lets us check out what is a Gigabit Ethernet and what specifications does it come with. Gigabit Ethernet is a part of the larger ethernet family of computer networking and communication. The Gigabit Ethernet standard is a means of theoretically supporting a maximum data transfer speeds of up to 1 Gigabit per second. When the work started on the Gigabit Ethernet standard, it was assumed that the technology would require a high-end cable like fiber optic and other special network cables. Of course, you need to have such wires for enhanced performance, but only if you are opting for long distance communication. However, for shorter distance transmission, you will only need a twisted pair copper cable. Ideally, the Gigabit Ethernet should efficiently work with the Cat 5e and Cat 6 standard cables. Please note that there are no specific Gigabit Ethernet cables specifically designed for the purpose. 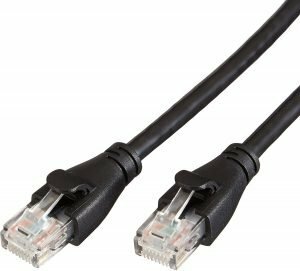 Most of the cat 5e and Cat 6 cables should support Gigabit Ethernet. The big difference between the Cat6 and Cat7 is the frequency. As you may have already seen above, a Cat7 cable and a Cat6 cable have the same rate. However, the Cat7 has a higher frequency than the Cat6. The frequency designates how often the signal can pass over the cable. At a frequency of 1,000 MHz, 10,000 Mbit/s can accordingly be transferred 10,000 times per second @ 10,000 Mbit/s. A Cat7 cable will, therefore, be able to transport data faster than a Cat6 cable. 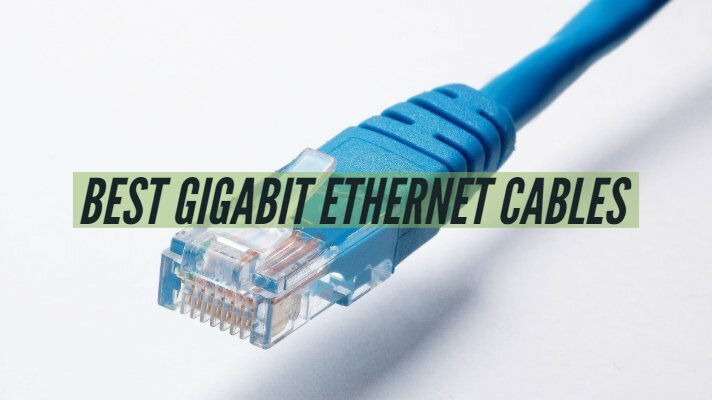 Having understood that the cat 6, 7 and Cat 5e cables can be used for the Gigabit Ethernet ports and functionality, here are the best Gigabit Ethernet cable options you can check out. The Cat 7 cables are one of the latest entrants in the Ethernet cable market and provide a theoretical 40 Gbps transfer speeds. 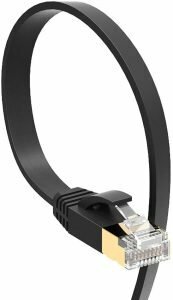 The Vandesail LAN Network Cable is an excellent option for achieving a rate of up to 10 GB per second. 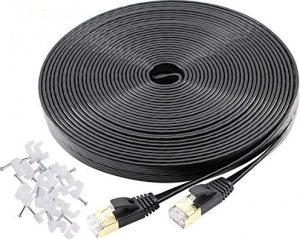 The cable conforms to the standards of Gigabit Ethernet and is available in a 16-foot size. These cables are backward compatible with older devices that may not support Gigabit internet performance. One of the advantages that it offers you would be the flat construction that makes it easy to use under the carpets. The cables can be procured in multiple sizes right from three feet to feet. The ethernet cable can supports speeds up to 10 GB per sec and offers you a bandwidth of up to 1000 MHz. The cable comes with two RJ45 connectors at each end. 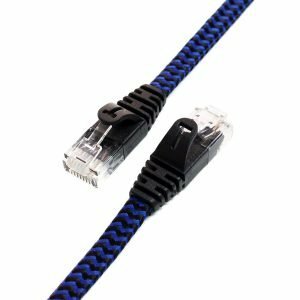 In sharp contrast to the Cat 6 cables, these cables come with additional shielding and improved quality in twisting of the wires. The cable works in application areas like Network Adapters, Hubs, Routers, DSL/Cable Modems, PS3, PS4, X-box, patch panels and other high-performance networking applications. This is a Cat 6 cable and offers you an excellent Gigabit Ethernet features. The cable is available in multiple length options ranging from 3 feet to 50 feet. Please note that better Gigabit ethernet functions will be possible with a maximum of 55 feet length. 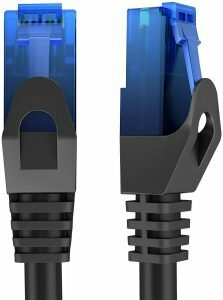 The RJ45 connector ensures uniform usability and functionality. Transfer data at speeds as high as 1 GB per second and get a bandwidth of up to 250 MHz. It can connect computers to network components in a wired Local Area Network. It offers you consistent connectivity and a safer functionality for office or home environments. As compared to the wireless connectivity options, a wired Gigabit Ethernet cable will ensure you access to a reliable and secure connectivity option. The RJ45 connectivity provides universal connectivity, and it should suit a wide range of devices like computers, printers, servers, routers, and switch boxes to network media players, network-attached storage devices, VoIP phones, and other standard office equipment. You can be assured of better signal transmission and a stable option at that. You can check out the cable at this link on Amazon. Another Cat 7 Ethernet cable, the Jadaol Cat 7 Ethernet Cable is an excellent option for high-speed internet connectivity for all your Gigabit Ethernet requirements. What makes it a formidable choice for most of your connectivity requirements is the fluke test carried out for each of the cables that land into the hands of the customer. Made from a 100 percent pure oxygen free copper conductor, the Jadaol Cat 7 Ethernet cable is available in a 50 feet size. The wire should meet the needs of a wide range of high-speed connectivity options like 10BASE-T, 100BASE-TX (Fast Ethernet), 1000BASE-T/1000BASE-TX (Gigabit Ethernet) and 10GBASE-T(10-Gigabit Ethernet). The cable is constructed with four shielded twisted pair (STP) of copper wires and offers an RJ45 connector at both the ends. The better quality of twisted cable construction will make it a great choice with a high degree of shielding provided within the cabling. The cable is available with the 20 cable clips to hold it in place. You are offered a lifetime warranty free replacement. 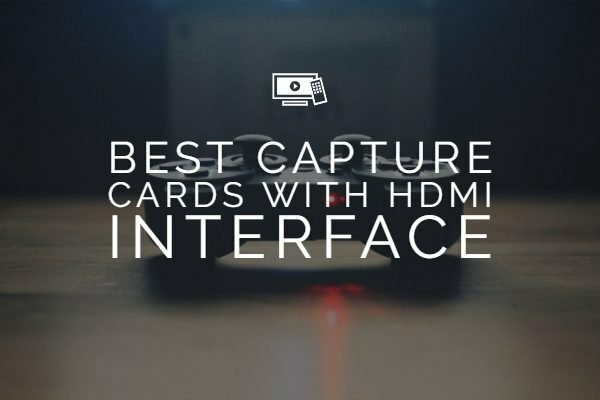 The cable supports bandwidths up to 600 MHz and transfer speeds of up to 1000 GB per second. The Cat 6 cable can support multiple application areas like 10 Gigabit Ethernet, 10GBASE-T, 1000 BASE-T, 100 BASE-T, 10 BASE-T networks. It will provide you access to a 250 MHz bandwidth for a higher data transfer. The ethernet cable offers you a high-end construction with the Ultra flat, slim 30 AWG wiring. The 100 percent copper construction will ensure that you will be able to achieve the best quality performance concerning both flexibility and durability. The corrosion resistant construction coupled with the molded strain relief boots will ensure that you have access to high-end durability. The ultra-flat construction makes it an excellent option to hide the cabling under the carpets so that it does go well with your décor. The cable ensures that you can achieve the best 10 GB per second speed and a 250 MHz bandwidth. The cable is specifically designed for the networking applications like Network Adapters, Hubs, Switches, Routers, DSL/Cable Modems, and Patch Panels. The wires opt for unshielded twisted pairs. The cable is available in 6, 12, 25 and 50 feet length. You can check out the cable on Amazon here. 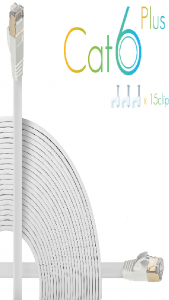 The AOFORZ – Ethernet Cable comes with a Cat 6 specification and offers you high-speed internet network. The cable comes with ultra shielding and anti-jamming technology to ensure durability and enhanced flexibility. The cable is made of a 100 percent bare copper wire and ensures maximum protection against the signal interference. The cable is bundled with ten clips and thus can be used for a secure connection. The ethernet cable comes with support for 10BASE-T,100BASE-TX(Fast Ethernet),1000BASE-T/1000BASE-TX(Gigabit Ethernet)and 10GBASE-T(10-Gigabit Ethernet). The flat design will ensure that it can easily be hidden behind the table, under the carpet or furniture. The Cat 6 cable ensures that you can have access to bandwidth performance of up to 250 MHz. The RJ45 connectivity will ensure that you have universal access to practically any sort of network. Some representative examples include LAN, WAN, UTP, and TCP/IP network. 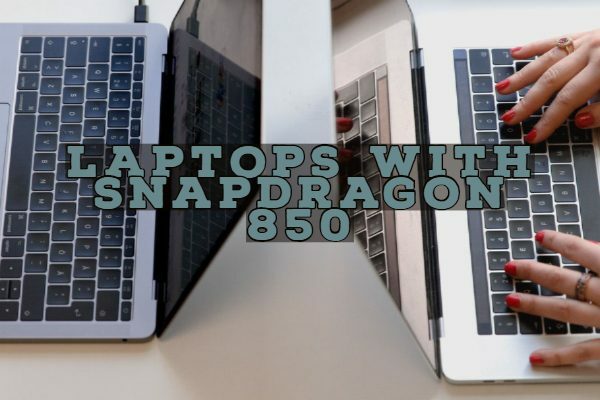 This will make them compatible with a wide range of devices like PCs, Laptop, Computer, servers, printers, routers, Extenders, Internet Cameras, TV Boxes, switch, network media players, NAS, VoIP phones, PoE devices, Mac, and MacBook. You can opt for the Gigabit ethernet cable from this link on Amazon. The KabelDirekt TOP Series offers you access to the best in class performance in terms of 1Gbps Cat6 UTP Ethernet Cable. You will have access to the best performance with a lightning-fast connectivity functionality with a 1 Gbps data transfer speeds and a 250 MHz bandwidth. The Cat 6 cable offers backward compatibility with the older devices and lets you have access to the better functionality with Cat 5 and Cat 5e cables or even the older cables or ports. The corrosion resistant construction and oxygen free wiring will help you reach the best durability functionality. The cable also comes with Snagless RJ45 connections comes with locking tabs, and thus you do not have the unexpected disconnection nightmares. The cable comes with no stiff shielding and thus can be easily accommodated in any area with ease. The thin and flexible construction makes it easy to work within any awkward positions. The cables come to you after a thorough quality control tests so that you are assured of complete satisfaction. Also, you will have access to an 18-month warranty. You can check out the cable on Amazon at this link. Which cables are the best options for your Data transfer needs? Which category of cables would suit you? Of course, from the Gigabit internet point of view – it should be one of the excellent options to go with a Cat 5e or Cat 6 cables for a realistic Gigabit performance. But, which one would you go with will be dependent upon your connection requirements you may have. While Cat 5e cables can be one of the best options for working with home networks, the Cat 6 cables can be your best mate for the ultimate high-speed performance. However, if you are an average user, opting for a cat 6, Cat 6 or a Cat 7 cable can become quite an expensive option and something not needed at all for your exact needs. Those were a few top end Gigabit Ethernet cables you can opt for if you are looking for great data throughputs. Right from gaming to other essential requirements, you will find the wires featured here providing you a great deal of performance.